As you can imagine there was an enormous grin on his face (and on mine!) He loves reading cookbooks and helping me come up with recipes I share with you. The fact that he has picked up on unsalted butter and large eggs is pure awesomeness. While I decided against making the muffins, I figured a cake is pretty close to muffins and went with this Carrot Bundt Cake with Cream Cheese Swirl. Carrot cake and cream cheese were made for each other and both are highlighted beautifully in this cake. The cake is spiced with cinnamon, studded with raisins (or nuts, if desired) and has three full cups of shredded carrots. It is a perfect complement to the lovely cream cheese swirl in the middle. For the topping, I went with a simple dusting of powdered sugar so the cake and cream cheese center would remain the focus (and as a bonus, save a few calories too!) If desired, a basic cream cheese frosting would take this cake to a whole new (tasty) level! Preheat oven to 350°F. Spray a 10-cup Bundt pan with baking spray and set aside. In a medium bowl, whisk together flour, baking soda, cinnamon and salt. Put carrots, sugar, oil, eggs and vanilla in a large bowl and beat until combined. Gradually add in the flour mixture, beating on low until combined. Fold in the raisins (or nuts). In a separate small bowl, add cream cheese, sugar, egg and vanilla and beat until combined. Bake for 50 to 60 minutes, or until a toothpick inserted in the center comes out clean. Let cool in pan for 10 minutes, and then remove from pan to a wire rack to cool completely. Dust with powdered sugar, for serving. 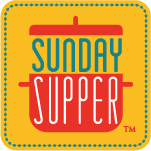 Today the Sunday Supper group is sharing recipes to celebrate Easter and Passover. While these recipes are wonderful for these holidays, many are also delicious for any celebration. From Breakfast/Brunch to Appetizers to Breads to Sides and Salads to Main Dishes to Desserts, there is a lot to see today. Grab a drink, get comfy and enjoy the virtual feast! Your bundt cake is just beautiful! I love the cream cheese center! Yum! I’ll take a big slice please! I LOVE anything carrot cake! Wow!!! I’ve never made a carrot cake Bundt cake, so this is going on my to-do list! So beautiful!!!! Happy Easter!!! Looks soooooo good! Mmmmmm Happy Easter! You have a VERY smart 4 year old! I’m glad you went with the cake…it is beautiful and makes for a more dramatic presentation. What a beautiful bundt cake, thanks for sharing! Your cake came out so beautiful! I love the cream cheese swirl too, carrot cake wouldn’t be complete without it! I showed Mrs. Stuntman the pics of this cake and now she wants a bundt pan. Very impressed by your technique! This cake is calling my name! So perfect for Easter!